The current regional theme at Maude is the Central Coast. The Central Coast menu was launched in July and I went for the first time in early July. It is a menu comprised of the bounty that the central coast has to offer, from fresh seafood to vegetables. And the wine pairings celebrate the delicious wines coming from Santa Barbara and more. One of my favorite dishes was the Rock Crab, served in the crab shell, and topped with truffles. The Rock Crab was paired with the Palmina 2010 Sisquoc Nebbiolo, Santa Maria Valley. In July, the truffles were shaved over the Rock Crab. Freshly shaved truffles were delectable and added an earthy touch. But, a month later, it was a black truffle sauce over the Rock Crab. The rich sauce with the delicate crab was one of the best bites of the night. the Santa Maria Valley, which was first planted in 1998. Winemaker Steve Clifton helped plant the Nebbiolo vines that he now works with for his Palmina wines. The Palmina 2010 Sisquoc Nebbiolo is drinking beautifully now. The wine has aromas of rose petals, lavender, black cherry and baking spices and a soft, velvety texture on the palate. The creamy richness of the truffle sauce enhanced the silkiness of the wine and the earthiness of the sauce accentuated the rose petal and lavender aromas of the wine . It was just a beautifully synergistic moment, a “WOW” moment. And that is why the Palmina 2010 Sisquoc Nebbiolo paired with the Rock Crab with truffle sauce from the Maude Central Coast menu is the Please The Palate pick of the week. 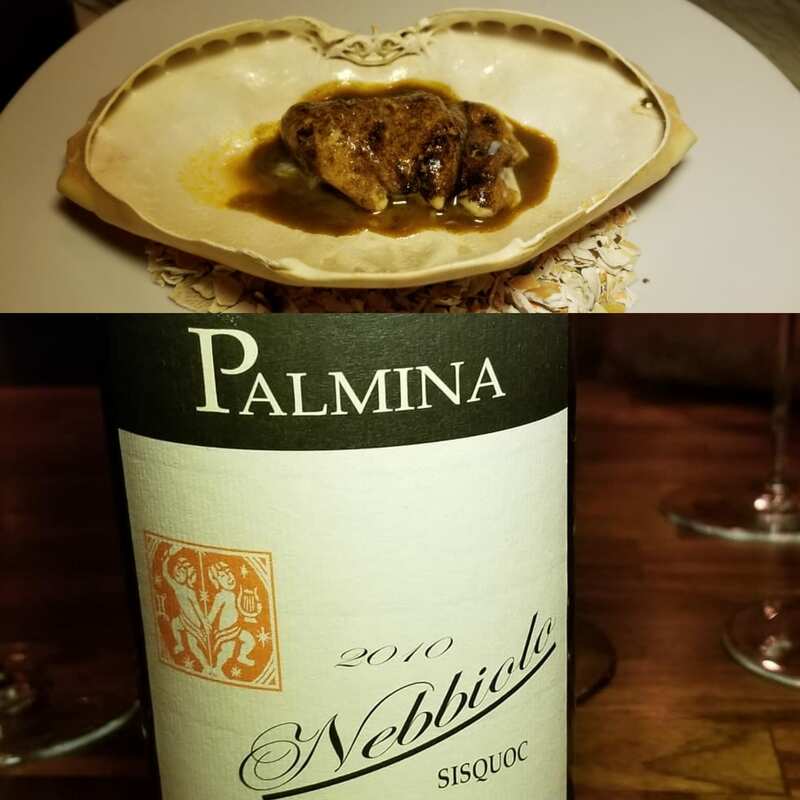 This entry was posted in Food, Lifestyle, Wine and tagged food, food and wine pairing, Maude, Maude Restaurant, Palmina, Palmina 2010 Sisquoc Nebbiolo, Palmina Wines, perfect pairing, pick of the week, Please The Palate, Steve Clifton, tasting menu by Allison Levine.